Click Here to sign up for Newsletter. Free informational .pdf tip sheet link below. BlogTalkRadio Show “Artist’s Helping Artists” Interview. We share the process of running your own touring workshop in the US and abroad. Our new Business of Art Workshops ebook package includes chapters on Scouting Locations, Negotiating Lodging, Pricing, Newsletters, Promotions, Insurance, Scheduling and so much more. Sign up for our newsletter for updates, free .pdf lessons and tips, and early release announcements. 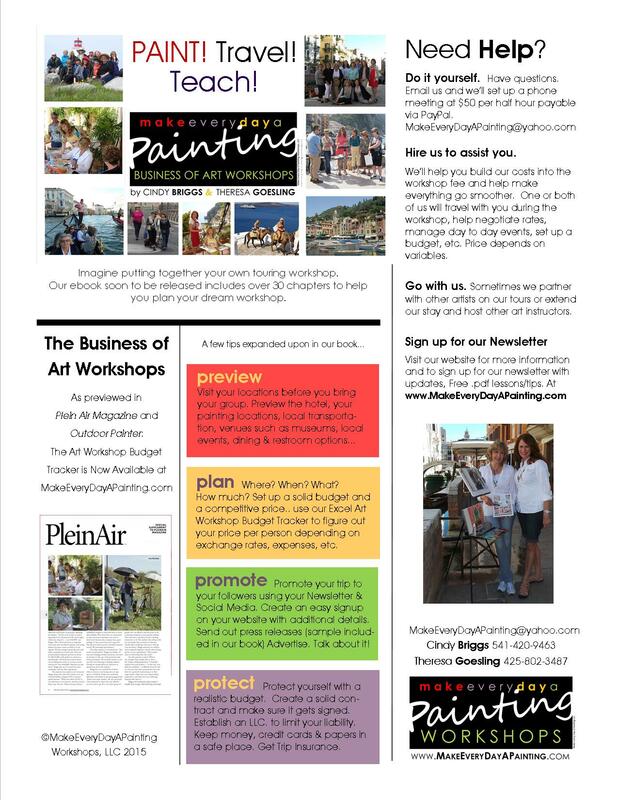 Click Here for your Free .pdf tip sheet: The Business of Art Workshops – Paint! Travel! Teach!